Storyline: Little Cub is alone in a meadow. It looks like he has always been alone with no one to take care of him. But he doesn’t like the dark night. He doesn’t know how to catch fish so he is hungry and he is afraid to get honey as well. He wished he wasn’t alone. Deep in the forest, the Old Bear is living by himself as well and he doesn’t like the dark nights either. He does catches fish and he does eats honey but he wishes he could share. 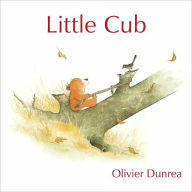 Illustration: Olivier Dunrea is also the illustrator of this book. His illustration is economical, portraying only what is necessary, this way bringing attention to the characters. Mostly, he focuses on depicting feelings rather than actions. With pencil and gauche artwork, in earthy colors, his paintings fill the page while the text is centered on the opposite one.